From January 24 to 28, I joined my colleagues at USC Shoah Foundation in Poland to stage the Auschwitz: The Past is Present program commemorating the 70th anniversary of the liberation of Auschwitz, which included a professional development program for 25 teachers, a learning experience for 13 students aged 10 to 17, and a “mission” for supporters and board members. USC Shoah Foundation also staged a reunion of four child survivors pictured in a famous Auschwitz liberation photograph. My first visit to Auschwitz was on my first full day in Krakow, Poland. Two colleagues and I took the general tour offered to the public – a three and a half hour experience in which groups of about 20 are led around the grounds and exhibits of both Auschwitz and Birkenau by a knowledgeable guide who speaks your language. The tour is fast-paced, solemn, and overwhelming. Groups speaking English, Hebrew, Polish, Spanish and more jockeyed for viewing space in front of display cases of piles of shoes and cans of zyklon-B. We all hurried to keep up with our guides, who only paused for a minute or so at each exhibit or barrack to speak and give everyone a chance to look. Though I left the tour humbled and pensive about what I had seen, the experience was surreal. There was something missing, and I couldn’t figure out what. My next two visits gave me my answer. I returned to Auschwitz the next day with Gabor Hirsch, a survivor who appears in the liberation photograph as a 15 year old, and his two grown sons. They were there to be interviewed by the BBC and Swiss television. While Gabor and his sons were remarkably poised, being in Auschwitz with one of its survivors gave the place a completely different feeling. Here was a man who had been starved, abused, and separated from his mother forever in this very spot, yet 70 years later here he stood again with his own children, recounting his story. As Gabor walked slowly but deliberately past the rows of brick barracks, his sons on either side of him, Auschwitz began to feel real. The next day, January 27, was the official commemoration program organized by Auschwitz-Birkenau State Museum held outside the infamous “Death Gate” at Birkenau. Three survivors gave impassioned speeches urging remembrance as well as action against current anti-Semitism. We sat in silence as a string quartet played, followed by religious leaders who said prayers for the dead. By the time the ceremony ended, the sun had set and snow had begun to fall. The survivors, accompanied by young people, walked from the tent at the Death Gate to the memorial erected near the destroyed crematoriums to place candles in memory of the 1.1 million victims of Auschwitz-Birkenau. As I watched the survivors walk, from video monitors inside the tent, I realized what had been missing from Auschwitz all along: them. Without the voices and stories of survivors, visitors to Auschwitz may not truly understand the intimate details of the suffering that occurred there. Auschwitz-Birkenau State Museum is one of the most popular tourist attractions in Poland, with thousands of visitors every day and even bigger crowds during the summer months. It has the power to truly affect each and every visitor on a deeply personal level by painting them a realistic picture of what camps like Auschwitz and Birkenau really meant for the ordinary people who were sent there. Auschwitz-Birkenau State Museum can do this through testimony, and it has already begun. USC Shoah Foundation is currently fundraising to make the museum a full access site of the Visual History Archive. This would allow all museum visitors to watch video testimonies of Auschwitz survivors in the very place these survivors describe. Instead of just listening to a guide talk about the cruel selections, the starvation, the disease, the separations from family members, and all the otherwise unimaginable realities of life within the barbed wire fences of Auschwitz and Birkenau, visitors will be able to hear firsthand from people who were really there. The testimonies will put faces and names to Auschwitz, and transform it from a historical site into a living, breathing example of the consequences of hate and intolerance. 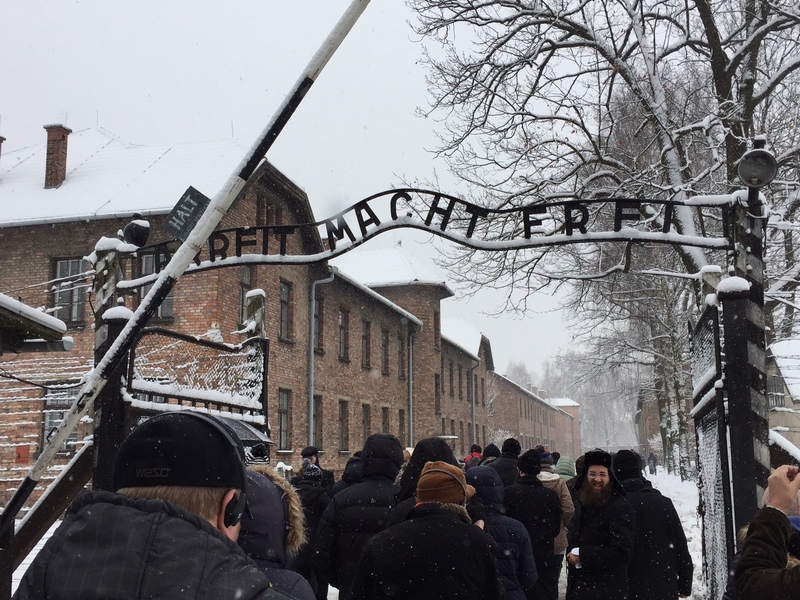 Seventy years after liberation, most people will never have the opportunity to visit Auschwitz with a survivor, or attend a commemoration with hundreds of survivors present, in order to grasp the magnitude of what happened there. But with the Visual History Archive safely preserved at the museum, I am confident that after one visit, they will feel as I did after three days. Though Auschwitz was an attempt to silence millions of people forever, its survivors are the key to keeping its memories alive. I can’t wait for everyone to start listening. To help bring the Visual History Archive to Auschwitz-Birkenau State Museum, text A70 to 41444.